Have you ever dreamt of visiting alien worlds? Have you ever wished you could zip through space via jet pack? What if you could defy gravity and explore unknown realms freely? Imagine being a space adventurer, paid to meet and greet alien cultures, while representing and protecting all of humanid-kind. You’d live to tell tales of glory. You’d be the stuff of legends. Sounds like a dream job, right? Well, no job is perfect, and there is a high price to be paid for this fantasy. That’s reality for a Skyraco. The Skyracos are winged warriors that conduct inter-planetary missions throughout the Zoland system. They receive directives from the governing council on their home-world Centrus. The Council members serve differing agendas, all with a stake in what assignments the Skyracos undertake. Many reap rewards while Skyracos absorb the risk. Skyracos operate on the frontier of the known, on worlds remote and unimagined. They must deal with logistical problems derived from vastly stretched supply and communication lines. Often their only humanid contact is with the other members of their own small teams. They execute orders from far away Centrus while fending and foraging for themselves. Operating outside the reach of the Council, they are isolated and afforded great powers of authority. They are forced to interpret crises and dispense justice on their terms. Different entities see Skyracos through the prism of their own interests. To the Council of Centrus they are the upholders of property laws. To businessmen they are insurance policies protecting investments. To the citizenry of Centrus they are combatants fighting some distant battle. Believers in Zod see them as missionaries, claiming dominion over alien animals and vanquishing evil. Their allies view them with a wary eye. To enemies they are the armored boot on their throat. To space settlers they are protectors. To kids they are idols, superheroes always on the side of good. And for young adults, joining their ranks may be the only means of survival. A Downward Economic Spiral has struck Centrus and times are tough. The Skyracos promise good pay and offer the only available jobs. Many enlist. Skyracos are defined by outside perspectives, but the only way to understand them is to become one. Then the truth becomes clear. Skyracos are just average people doing a job they sometimes hate. Over time new recruits fade into a washed out reality, governed by the basest of human character. Survival replaces purpose. Necessity replaces righteousness. Instinct replaces reason as strangers replace friends killed in battle. They are purveyors of death in perpetual mourning for lost comrades and lost innocence, all while deeds are cloaked by mythology. They bleed for others' greed, fighting to remain more civilized than their leaders. Eventually every Skyraco comes to realize another stark truth… all heroes don’t make it home. Welcome to their uncomfortable world. Recent recruit, Chip Daniels wants to be a hero, but gets more than he bargained for once incased in his streamlined flight suit. Chip and the rest of Unit 9901 are ordered to investigate a mysterious plague outbreak in an isolated mining colony. What starts out as a game quickly unravels into a life or death crisis. 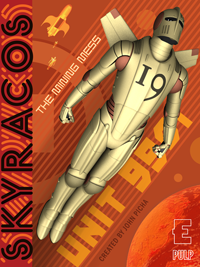 Notions of good and evil spin into a nightmare of moral ambiguity, which challenges Chip's definition of heroics..
"Skyracos: The Mining Mess" is a retro sci-fi ePulp adventure tale of flying men forged from the same mettle as Flash Gordon, John Carter and the Rocketeer.